Rendez-vous avec un chauffeur à votre hébergement à Marrakech pour un départ à 9h30, puis rendez-vous à la ferme dans un véhicule privé climatisé. 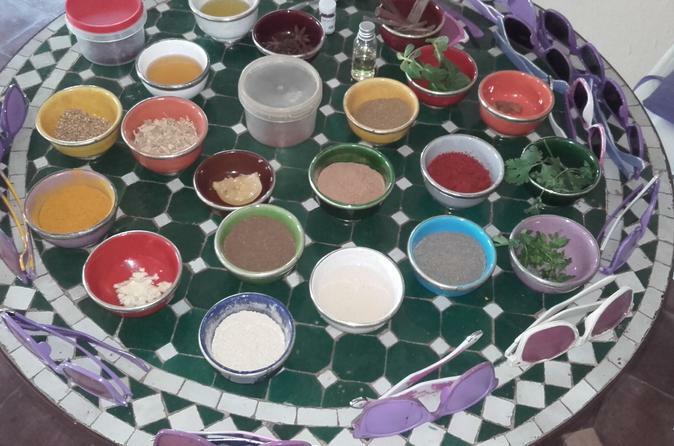 Rejoignez un cuisinier local pour une journée dans la cuisine, commencez par tester votre nez sur un test «Devinez les épices», en essayant d'identifier les pots d'assaisonnements marocains non étiquetés. Relevez vos manches pour préparer un repas complet, comprenant du pain, de la salade et des crêpes marocaines spéciales. Le plat principal change tous les jours et des plats végétariens et sans gluten sont disponibles sur demande. Pendant que vous cuisinez, profitez de votre temps avec un chef local pour vous familiariser avec les traditions de la cuisine marocaine ou posez des questions sur les aliments que vous avez découverts lors de votre visite dans le pays. Lorsque le repas est prêt, asseyez-vous pour un festin marocain classique sur la terrasse extérieure de la ferme, et mangez à l'ombre d'arbres fruitiers florissants. Le repas se termine vers 16 heures et la journée complète de cuisine marocaine s'achève par un transfert aller-retour à votre hôtel. We had good fun with Ilham cooking our tagines, bread and salads, good instructions and enjoyable. The blind spice test with Michel was a little long and tedious, especially when it was obvious that we didn’t know and I didn’t appreciate the tricks. However, Michel was cheerful and funny. I would have loved to see some of the dessert being prepared as it was delicious. Overall, it was a good day and a lovely farm setting not too far out of Marrakech. Could not recommend this cooking class more! Michel was very insightful and humorous in providing an overview of Morrocan cuisine and Marrakech itself. We had a broad range of cooking abilities though all managed to create a delicious feast. We will definitely be taking the skills and recipes we learnt back home to share with our friends and family. Thank you! Can't recommend this highly enough. A proper cookery class not just a demonstration. Very professional but also warm and friendly. English and French speaking attendees but everyone felt included . Finished with lovely communal meal. Pick up and drop off included. I thought it was excellent value for money. Very enjoyable. Not only did we eat the food we cooked, but we were able to tailor our meals to taste. We were given copies of the recipes, and had an opportunity to purchase spices, food stuffs, and cookware. Bring cash. From the moment of being picked up from our accommodation in the comfortable mini bus, this was a fabulously informative day, we learned so much about the different spices used in Moroccan cooking as well as learning the techniques of cooking a delicious lamb tagine with prunes and all the accompaniments such as bread, semolina pancakes and salads. Michele and his partner were very entertaining hosts and multilingual too! He explained why certain spices and oils were expensive as well as how to check whether or not certain spices like saffron and Argon oils were genuine as there are many fakes out there in the souks .... So beware!!! Pity we hadn't had this info at the start of our holiday!!! It was reassuring to know that the various goods on sale were genuine and fairly priced too! The farmhouse was delightful with a great relaxed atmosphere, several sleepy cats around and chickens running free in the grounds. Refreshments of tea, water and fresh orange juice was served throughout the day. There was 13 of us, all with our own individual workstations and ingredients. After cooking, we all sat down for a feast by which time it was mid afternoon so ensure you eat a decent breakfast before hand! All in all another fabulous day! We really enjoyed our cooking class. We were picked up right on time. The farm house was lovely, well decorated. The hosts were really nice and Michael was a hoot.the other two couples were fun to talk to. The food we made was Awsome as well as the presentation. Absolutely stellar, a very enriching experience. I think they might do a different menu every day I was there on a Thursday, they mentioned doing a different menu the following day. If that's the case, it might be worth spending several days here. Have a few of your best French jokes ready to shut down the principal chef's husband btw. You'll see what I mean... Come prepared to throw it back in his face, it should add to the fun. This was the outstanding day of our week in Marrakech. The driver picked us up on time at our hotel and took us and the other participants to the farmhouse for the cookery class. On arrival we were warmly welcomed by Michel who is the epitome of French charm. We were also introduced to Ilham, his wife, who was teaching us that day. Introductions were made over a glass of mint tea - our fellow cooking classmates were, like us, keen cooks and had travelled extensively, so I knew we were going to enjoy the company as well as the class. Ilham demonstrated breadmaking, Batbout bread cooked on the stove top making it look so simple of course. Then Michel tested our knowledge of spices with some blind smelling. We wore special funky purple sunglasses, which was somewhat disorientating, which is of course the purpose, to shut down our senses. Some we all got but others baffled us - we all learned something new though. Then it was our turn to make the bread getting our hands into the flour and getting the right consistency was tricky at first, but Ilham was on hand to put us right. Next we prepared the beef tagine. Ilham talked us through it step by step, from the unique way of chopping onions the Moroccan way, cutting into the onion in a criss cross pattern, to preparing an artichoke which I messed up and then adding the ingredients to the tagine and using the spices, some of which we had been learning about earlier. Once we all had our tagine bubbling on the stove, Ilham prepared three salad dishes to go with our meal, an eggplant salad, a cucumber 'soup' and a tomato, cucumber and grilled pepper salad. While we watched this demonstration we nibbled on some home made savory biscuits which were delicious. Then while we waited for a tagine to finish cooking the class retired to the sunny terrace to chat about our day. The last demonstration was the making of Msemen, which is is a sweet pancake type dessert. The highlight of the day of course was sharing the food we had made on the terrace, with our fellow classmates. It was a thoroughly enjoyable experience from start to finish - we were all reluctant to leave. Michel is a charming host, with a sense of humour that makes the day a relaxed affair. Ilhad is an excellent and patient teacher. While we all learned new skills, most importantly we had fun, had good conversations and enjoyed a traditional meal in a lovely location.